Finished my first semester of my master’s program, had a short whirlwind break, and now I’m back in class for my second term. Time is flying by! The course-work is very challenging, but I’m really enjoying it. It’s also time to plan my next research trip to London, a new dress for dancing the night away in the Hall of Mirrors at the Chateau Versailles costume ball, prepare to present about needlework pattern books at the Textile Society of America‘s biennial symposium in Savannah, Georgia, and plan to finish my master’s thesis by the end of the year! Those are just the current major highlights. It’s going to be a big year! The Babel Conference Off the Books was amazing! The presentations that attended were thought-provoking and inspiring, and I really appreciated when the panel had planned a lot of time for discussion. My paper was on 16th-17th century needlework pattern books and how they were often destroyed in the process of using them. 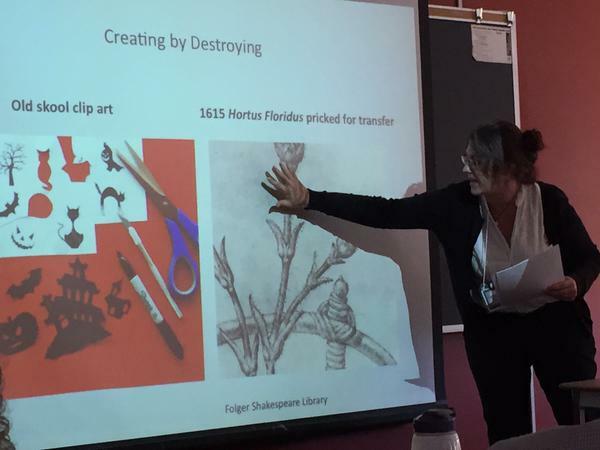 I got lots of supportive comments and heard that I even helped another scholar solve a mystery about the 16th c. editions of Chaucer books she was studying! It was a wonderful group of people in general, and I also enjoyed Toronto. Yay for new friends! Just a quick update to say that I added a handful of new photos to the gallery pages. Still lots more to come! I wish they were all “gallery” quality, but they still document my work. I completely missed writing a post for July! Granted, I was away for half the month to visit family, but still. I’ve collected several conference notices of Calls For Papers (CFP). I’m wary of adding voluntary homework on top of starting my master’s program next month, but I guess that would be a good problem to have, right? As I evaluate each, I’m considering how my topic of Early Modern needlework and needlework pattern books could be interpreted through the lens of the conference theme. The exercise helps me expand my research scope by turning it upside down and looking at it from new angles. As a wedding gift for a dear friend, I embroidered a pair of garters. I reproduced a pair in the Museum of Fine Arts Boston, using a motto from another pair, and working with the best supplies I could find. It is my finest embroidery work to-date, as I was really striving to match the quality of workmanship of the originals. While I will be writing a longer blog post on LiveJournal about the process and materials, I wanted to make a short entry here now that I have delivered the gift. This process and my latest museum visits has me thinking that I may enjoy doing reproductions for museums. 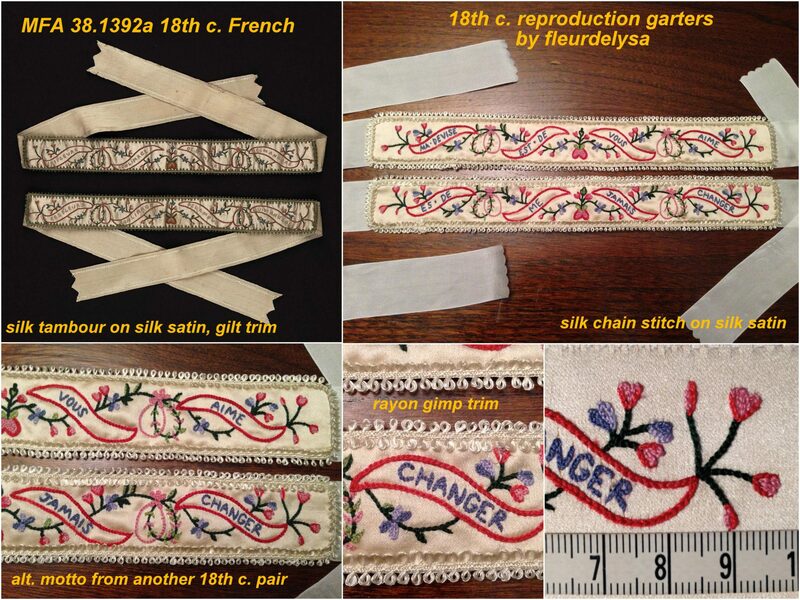 I know they use them, and I feel that it is the kind of work I would find very gratifying, especially in conjunction with my academic work in historical needlework. We’ll see what comes. I received the 2015 National Fellowship Chapter Honorary Mention Award with financial reward for academic excellence! I applied through my undergrad university, Arizona State University, for the Phi Kappa Phi National Honor Society’s annual national fellowship for new graduate students. While I didn’t score the big money, I’m very pleased to accept the financial support and to know that my association is rooting for me!